It is no secret that compatibility is really important for a healthy relationship. The misnomer that opposites attract has gotten lots of us in trouble, so I was really curious to see just how compatible my husband’s character strengths are with mine. I LOVE a good survey, and the VIA Character Strengths survey was a fun self-learning activity. I wasn’t, however, so sure that my dear husband would be so eager for a little self-reflection. Being the good guy he is, he agreed to take the survey. He agreed on one condition—I couldn’t peek at his screen as he went through the questions. He also made it clear that he didn’t need my help, so I sat by quietly letting him do his thing. Once he was done, he was ready for us to compare notes. Not to toot my own horn, but that’s right…4 our of 5 of our core strengths are the same! Research shows that when people pick partners that share values and interests, they are happier in their relationships. No wonder we have made it 17 years and are going strong! 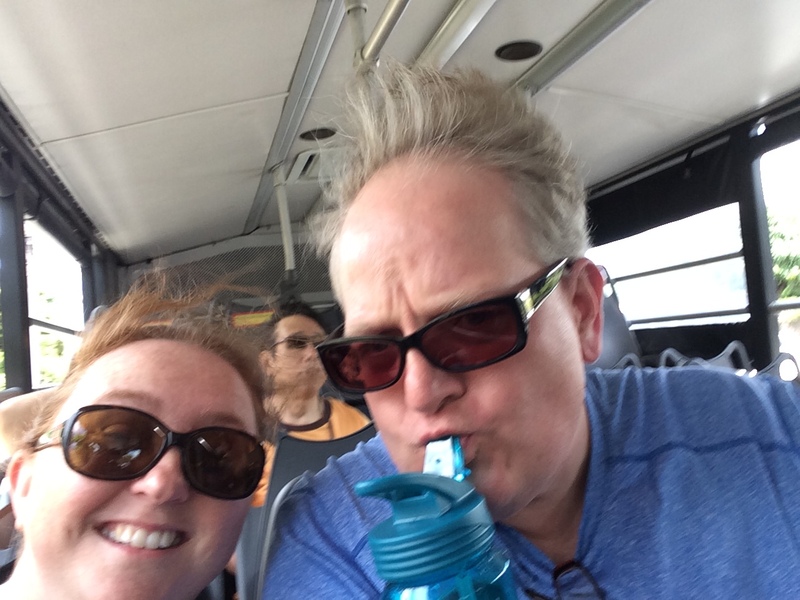 Even bus rides are fun in Hawaii! I’m pretty sure that if we had completed a movie genre compatibility survey we might not have been ranked as compatible. I’ll watch a Sci-Fi film to make him happy and he’ll happily surf the web next to me as I watch realty TV, but it turns out we are not compatible in all things. That is human. There are lots of couples that are highly compatible that have very different strengths. At the crux of a happy relationship is shared our values and interests. I was pleased to see that our character strengths lined up so well, and I think that speaks to our shared values. What does this mean to me? I’m not sure there is research specifically about this, but I’m pretty sure it means that we are compatible and that I made a good choice 17 years ago. More importantly, though, it means that we are both making choices every day to make our relationship a priority and that over the past 17 years, we have grown closer and possibly more alike. And taking the VIA Character quiz with my husband was fun—it created a romantic moment and helped us feel connected. Dr. Kim Allen is a Family Life Coach and Assistant Professor at North Carolina State University. She has been married to her husband for 17 years and they have two girls together.